Several weeks ago I was trying to remember the name of an artist and the name of Ben Shahn came into my head. It was not the artist I was trying to remember, but I suddenly remembered once loving Shahn’s work, though I hadn’t thought about him for years. That set me off on a search for images. I thought you all might enjoy a little glimpse of the work of Ben Shahn. That’s him, standing way back there. The painting is Portrait of myself as a young boy. 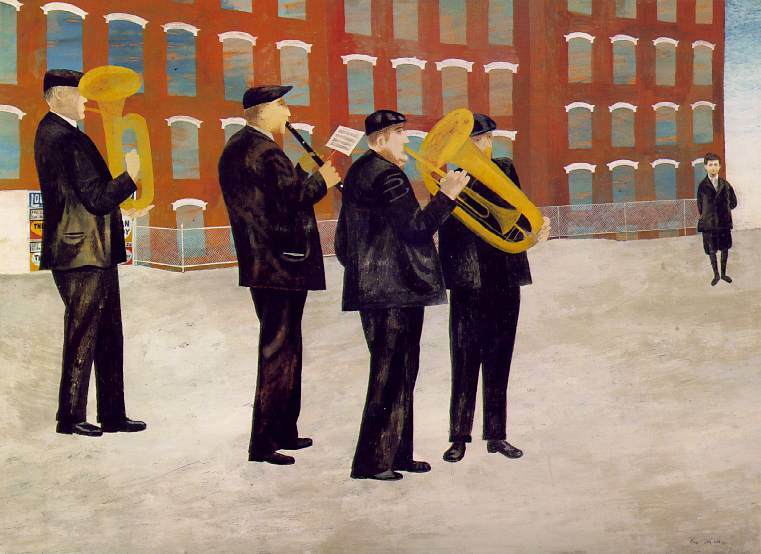 Ben Shahn was born in Lithuania in 1898 and his family emigrated to the US in 1904. He worked as a lithographer’s apprentice while he studied at night at New York University and the National Academy of Design. He was considered a Social Realist when he began painting. Much of his work was based on the news and issues of the day, in the ’20s. One of his most recognizable works concerns the murder trial of Sacco and Vanzetti, which many people believed to be prejudiced due to anti-Italian biases of the judge and jury. Shahn’s work seems to me very evocative of the periods of the ’20s, ’30s, ’40s and his New York City location. There is a grimness about it, even subjects like the musicians and the handball players have a weary sadness about them. Showing quite a different side was Shahn’s work as an illustrator and graphic artist, but it too seems to retain that sense of starkness that you see in his paintings. His sense of line and graphic expression is wonderfully spare. There is a documentary about Shahn called “A Passion for Justice.” I have not seen the film, but found a lot of interesting information and good images at this web site about the film. I am looking for a picture by Ben Shahn called ‘The First Commandment’ and I can’t find it anywhere. Any ideas? This is a wonderful collection Thank you. Ben Shan is also one of all time favorites. I am moved by his art and his humanity. I came across your site because I am looking for a present day Ben Shan to illustrate a Haggadah for Yom HaShoah (the Holocaust) which we are publishing. Have you anyone to suggest? Shahn’s compositional style is fascinating. His imagery is always a little off-base, not quite in balance. In “Portrait” the little boy has to carry the weight of the band, and of course, he doew — your eye goes instantly to him. In Sacco and Vanzetti, the long thin ratio lenght to width of the work puts the caskets at the very bottom of the painting and one’s eye is drawn to the smug “sanctimonious judge” at the top. The composition is crucial to meaning. And in the Handball, the middle of the canvas is a complete blank, except for the lovely mottled colors of the wall (likewise Vacant Lot). If you’ve ever played handball or racquet ball, there is that almost awful blankness of the wall, out of which the zooming line of the ball comes back at you (in rqacquetball, I was always a little afraid of the ball — it could really hurt when it hit your flesh). I too see this as a metaphor, a kind of sadness, perhaps, but even more, the insurmountable odds against which the players are working — the great blank wall. It’s like “The Passion” — Sacco and Vanzetti against the implacable walls of the establishment, which put them to death unjustly. I think this is what I mean when I talk about making the work “meaningful” — that the compositional elements here make a statement and they make it against our usual expectations of “good” composition. What do the rest of you think about the way Shahn establishes meaning in his work? Thank you Terry for sharing the work of Ben Shan, one of my all time favorite artists. I went to college in Buffalo, NY in the 1960’s. Our music 101 teacher was the coral director of the Presbyterian Church on Deleware Avenue so I attended church there. The Jewish temple was across the street and it burned so badly that it had to be torn down and rebuilt. The Presbyterian minister asked the Jewish fellowship if they would like to used the church for their temple until the new one was rebuilt…they accepted and when the new temple reopened we were asked to have a serivce there as a thnk you. The new structure was awesome with concrete shell shaped walls and the 10 Commandment pillars and the stained glass windows..all designed by Ben Shahn! What an art lesson that was. Later in the 1960’s I was asked to go to a Syracuse Univ. foolball game that would star Larry Czonka….a great guy, I’m sure, but not a big draw for me! But on the way to the dome while walking across campus we walked past a mosiac that was in disrepair of the Sacco and Vanzetti picture that you showed. There was a little gentleman it a tweed cap and jacket there repairing this beautiful piece of social commentary. We stopped to watch him for a while and I told the person I was with [the SU sports fan] all about the story behind it and everything I was pleased to know about the artist, Ben Shan and his work! The gentleman repairing the mosiac never turned around…he just kept working. The next day in the newspaper, there was a photo of the mosiac being repaired by no other than Ben Shan himself! Thanks for the memory! Thank you for a wonderful post. Your comment about the shopping carts is perfect. I keep coming back to look at that image. The supermarket baskets were a 1957 serigraph.They reminded me of the kind of little drawings you see in the New Yorker magazine filling space at the bottom of columns. Little scenes of ordinary life, but through the eyes of an artist who makes a genuine celebration of line and form. A fascinating array of work. I like the backgrounds in each painting and how they contribute to the mood, the story, the composition. The Sacco and Vanzetti trial and execution inspired him to do a series of 23 paintings and prints; he felt he was “living through another crucifixion” (perhaps why the word Passion is used in the title of the well-known painting Terry included above). The three men are the commissioners who declared the trial was fair; Shahn mocks them as mourners. The man in the picture in the background is the judge, portrayed as sanctimonious and distant. Now, where did those fun shopping carts come from?! Thanks for introducing this artist – I misread “social realism” as “socialist realism”, which brings paintings of Russian wheat harvests etc etc to mind, so Shahn’s work was a pleasant surprise. The first picture shown brought L S Lowry to mind, perhaps because of the factory building and the black figures – and also a certain sadness that makes its way into Lowry’s paintings.